Cooking is one of my sources of little adventures in life and rabbit has been on my list of food adventures to have for a while now. 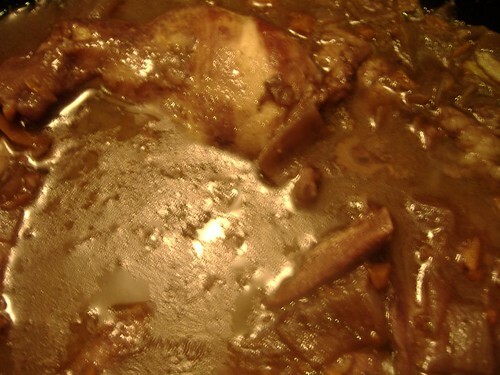 I selected Rabbit Stew with a Touch of Chocolate from The New Spanish Table from among the half dozen rabbit recipes in my cookbook arsenal. This one of my favorite recipes I’ve cooked yet. 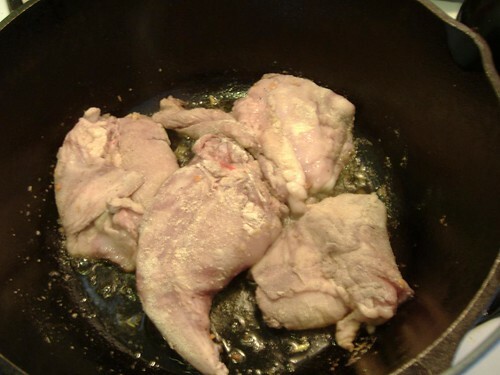 Maura dropped the cliche about what kind of meat the rabbit tasted like, but I think it was much more flavorful. The chocolate, even though it was just an ounce, makes it a rich dish. My first adventure was butchering a rabbit. 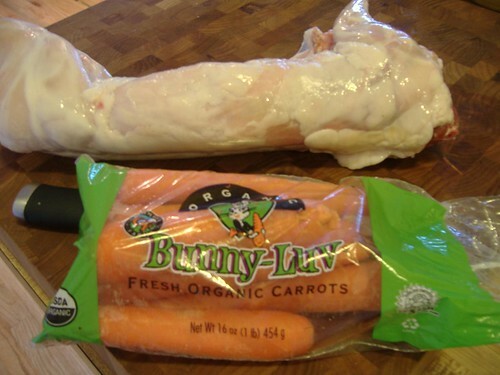 The farmer’s market sells whole, farm-raised rabbits. My cookbooks have vague, at best, instructions on butchering a rabbit: two back legs, two front legs, two ribs, and two from the saddle. The leg were essentially the same as cutting the legs from a chicken; you just have to find the joints. The saddle pieces I cut from the spine and got two lovely, thin, boneless pieces. The ribs were the challenge. I used my kitchen shears to cut the ribs where the meet the spine. In theory, you should be able to get your rabbit pre-butchered, but I wanted the experience. After butchering, you marinate the pieces with red wine, onion and carrots for four hours. Then you brown the rabbit pieces, then vegetables. 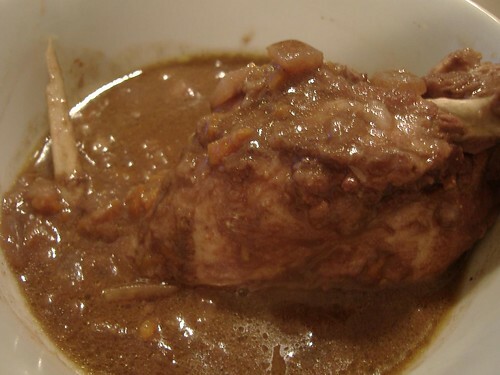 The stew part comes from the reserved marinade, chicken stock, and brandy (woot!) It simmers for an hour before you add the chocolate. Although everything is drenched in red wine, and bears the purple color until you add the chocolate at the end, You can’t really taste it in the end. The change from wine-y purple to a deep, rich brown was almost instantaneous about a minute after adding the chocolate. 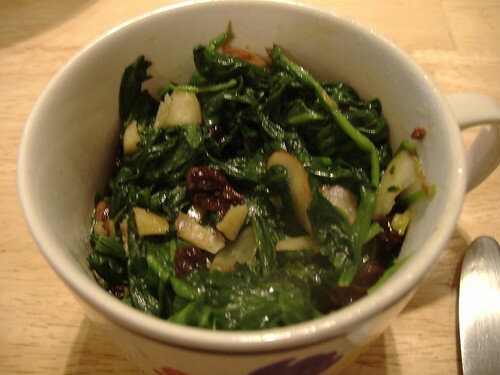 We paired the stew with one of our favorite sides from The New Spanish Table, Spinach with Pine Nuts. We haven’t had any pine nuts the last couple of times. It’s just as good with other nuts. We used sliced almonds. We’ve also decided that the four tablespoons of olive oil is too much, so this time I made it with two tablespoons, which is plenty to brown the raisins, garlic, and nuts, without making the final product overly oily. Eek, that kind of freaks me out. Your 4th picture looks frighteningly like a live rabbit. Hope you enjoyed it though!